Is U-Save Auto Rental CEO Tom McDonnell Guilty of Bankruptcy Fraud? The post Is U-Save Auto Rental CEO Tom McDonnell Guilty of Bankruptcy Fraud? appeared first on Unhappy Franchisee. Posted in ALL | Tagged franchise news, Franchise Services of North America Inc., FSNA, Thomas McDonnell III, Tom McDonnell, U-Save, U-Save Car and Truck Rental, U-Save Car and Truck Rental franchise, U-Save complaints, U-Save franchise, U-Save franchise complaints, U-Save Holdings Inc. The post U-SAVE Parent FSNA Bankruptcy Rejected appeared first on Unhappy Franchisee. The post U-Save Parent FSNA Bankruptcy Filing – Franchise Services of North America appeared first on Unhappy Franchisee. Reposting this content without prior expressed written permission by Relentless, Inc. is strictly prohibited. The post U-SAVE Car & Truck Rental Franchise Disclosure Document appeared first on Unhappy Franchisee. 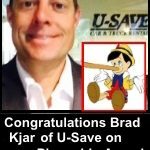 The post American Car Rental Association (ACRA) Board Member Bradley Kjar Wins Award appeared first on Unhappy Franchisee.